If it seems we’ve been spending a lot of time in churches recently, it’s no illusion. 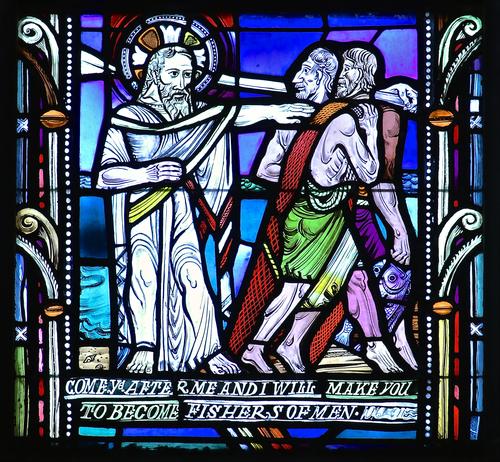 Edgar Miller’s most recognizable work may be his “handmade homes” in the Old Town neighborhood of Chicago, but many of his other impressive accomplishments are scattered about the architectural landscape of the Midwest sitting in plain sight in church windows, mausoleum design, and altar displays. As Miller so engagingly displayed in his residences that he could make sacred the ordinary apartment complex, it is no wonder that he was also sought out to apply his master craftsmanship to truly spiritual spaces. 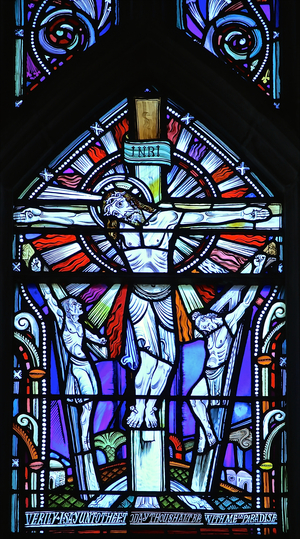 Sometime in the 1980s, Edgar wrote out a list of all the jobs he could remember completing, of which he mentioned three "memorial windows" in Des Plaines, Illinois. Going on a whim and a blurry image from the First Congregational Church’s website of what looked like Edgar-esque stained glass windows, we headed out to the close north suburb of Chicago to see what we could see. The building manager, Jim, invited us to come take a look, was very welcoming, and showed us some historical information on the windows he found in their records. 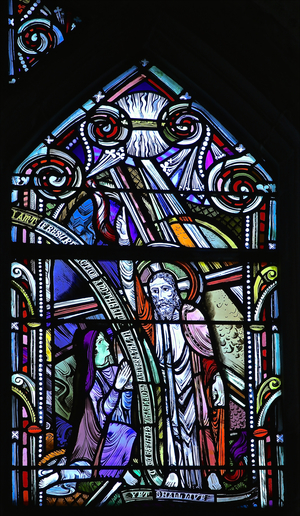 The windows were indeed by Edgar Miller, from 1947, and were given as a gift by William H. Fischer in memory of his wife, Beulah, who was one of the church's most loyal members and president of their Women's Fellowship Board. The windows were fabricated at the studios of Gianinni and Hilgart. 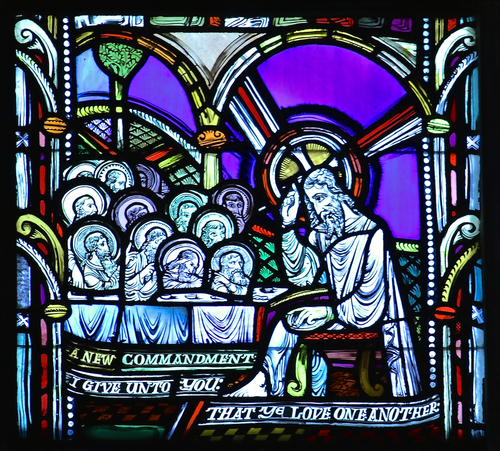 Each window panel depicts a different parable from Jesus’ life and teachings. The set of windows were built into the west side of the sanctuary, involving refurbishment of the entire chancel and altar area. Edgar, the decorative director, was also responsible for intricate wood carving along the altar canopy and a large gold-leaf scripture band encircling the chancel. The scripture band inscribes Jesus's answer to the question "What is the greatest commandment?" from Luke 10:27: "Thou shalt love the Lord thy God with all thy heart and with all thy soul and with all thy mind and with all thy strength and thy neighbor as thyself." The attention to detail in these windows is stunning and they radiate with Miller’s playful expressionistic tone. 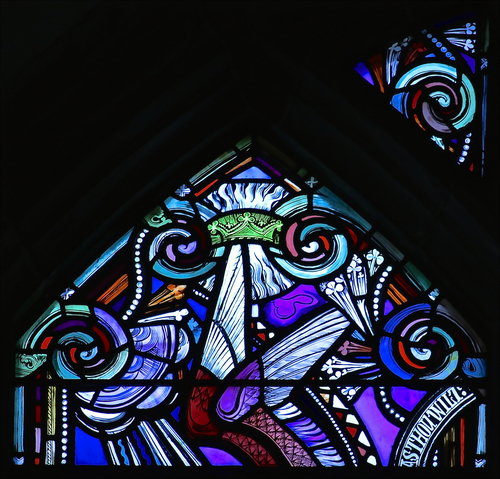 The windows are colorful and dynamic, yet still manage to convey the detailed gravitas of the stories of Jesus’ life and teachings. They clearly have been inspired by Renaissance art, and given the liturgical setting, it makes absolute sense why. Miller wasn’t necessarily going for a modern look, yet these windows still pop off the wall in a way that a modern designer would have considered. For now, enjoy our latest bounty of treasure. If you would like to visit the church, the best way to do so would be to attend a Sunday or holiday service when the church is open to visitors.